The move by the premier institute under the Ministry comes at a time when a three-year survey conducted by the WII’s own researchers reported sightings of tigers in the high-altitude forests of the Dibang Valley. Deviating from recommendations made by statutory panels under the Environment Ministry, the Wildlife Institute of India (WII) has virtually cleared the way for at least two proposed mega hydel power projects in Arunachal Pradesh’s Dibang Valley and Lohit districts, one of India’s most biodiverse landscapes. Records reviewed by The Indian Express show that in one case — the 3,097 MW Etalin hydel project to be jointly developed by Jindal Power and the Arunachal government — the WII was asked by the Ministry to assess the feasibility of the plan that requires 1,166 hectares of forestland in the valley. The Ministry’s move followed a recommendation from its Forest Advisory Committee (FAC) to conduct an environment impact assessment study. Instead, the WII initiated a study to find how the project’s impact on wildlife can be minimised — the institute is expected to submit its final conservation plan soon. In the second case, records show, the WII was asked to conduct a hydrology/ecology study by the National Board for Wildlife (NBWL) for the 1,750 MW Lower Demwe hydel project in Lohit district by Athena Demwe Power Limited (ADPL), a Special Purpose Vehicle of Athena Energy Ventures Pvt Ltd. However, records show, the WII held three meetings with ADPL “to find a way forward” and concluded three months ago that construction can be allowed while the institute conducted a two-year, Rs 1.85-crore study funded by the developer to decide the limits of the dam’s peaking operations. Siddhanta Das, director general (forests), Environment Ministry, ruled out the possibility of the WII influencing decision-making. “The norms are clear. If the WII does research for private clients, it will not be part of the decision-making process in the Ministry. If it meets developers on the Ministry’s behalf, it will place the details before the Ministry to take a call,” he said. Mathur and Das denied that recommendations of the FAC and NBWL were not followed. “It is for the NBWL and the Committee to point out such dilutions in subsequent meetings. But compositions keep changing and few are keen to take on the Ministry… when WII recommends a project, there is no ground to deny it clearance,” said a former NBWL member. For the Etalin project, the Ministry asked WII to conduct the survey “on mutually agreed terms and conditions with the user agency” after the FAC sought an impact assessment study during a February 2017 meeting. “The minutes record that the FAC found the existing impact assessment study inadequate and sought multiple seasonal replicate studies before deciding on the Etalin project… not a conservation or impact mitigation plan,” said Deepak Apte, director, Bombay Natural History Society, who resigned from the FAC weeks after that meeting. However, in an advertisement to hire researchers for the study in December 2017, the WII described the nine-month project as “Preparation for Wildlife Conservation Plan for Impact Zone of Etalin HEP”. The Indian Express has learnt that as part of the Etalin dam study, a WII team deployed camera traps around the project’s impact zone during January-April. G V Gopi, the WII researcher who conducted the tiger survey, was also part of the study at the dam site. However, when contacted by The Indian Express, Gopi declined comment. “Going by an interim draft (of the WII’s conservation plan), we are hopeful about a positive report,” said a Jindal Power official, speaking to The Indian Express on condition of anonymity. 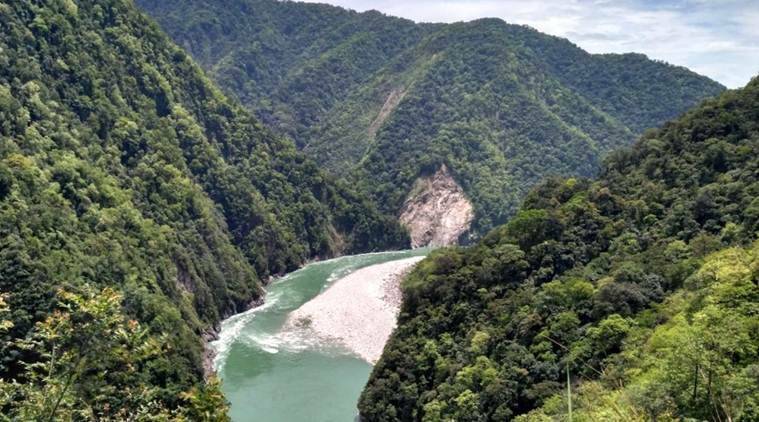 In the neighbouring Lohit district, the National Green Tribunal (NGT) had set aside the project’s green clearances in October 2017, with a three-member expert committee recommending “a comprehensive peer-reviewed study on the hydrology and ecology of three seasons”. However, the Environment Ministry asked the WII to submit its report in three months and the institute conducted a “rapid foot survey” over 20 days. “When the WII will find out the limits of peaking operations only after two years, why is it recommending construction of the dam today?” asked Bimal Gogoi, a conservationist who had challenged the project before the NGT. Records also show that the developer, ADPL, was taken to the National Company Law Appellate Tribunal by Indian Bank for alleged non-payment of Rs 334 crore in loans. In September 2017, the Tribunal initiated corporate insolvency resolution proceedings in the case.